The following is a guest post from Sherry at Disney By Pixie. 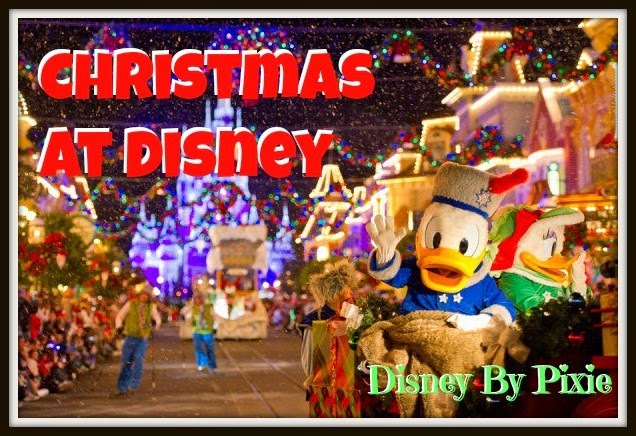 With the holidays fast approaching, now is the time to consider celebrating Christmas at Walt Disney World. It is truly a magical experience. There are so many unique activities to experience, the spirit of Christmas will completely surround you and your family. Who’s ready for a jolly adventure? Let’s start with Mickey’s Very Merry Christmas Party. This extra ticketed event runs on certain nights at Magic Kingdom, and it includes an exclusive parade, fireworks, character meets, activities, and snow falling. That’s right. SNOW. In Florida!! Who knew right? 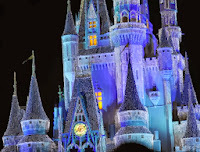 Plus, you can see Cinderella Castle all lit up..with magical ice! Thanks to Cinderella and her Fairy Godmother, Cinderella’s wish comes true to see the castle all decked out for winter. It’s awesome to watch! If you ever have a chance to attend this party, do so. It is a not to be missed event! The decorations are top-notch, and you can wander around, drinking in Christmas; And, of course, the big guy himself Santa makes an appearance. How cool is that? 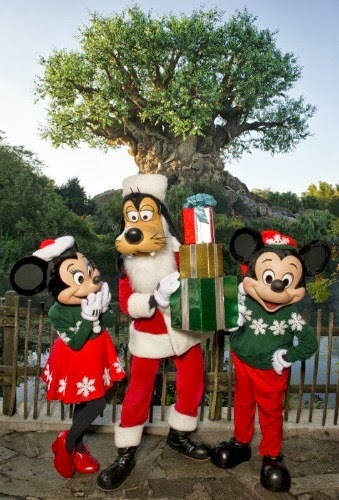 Walt Disney World is unlike any other vacation, and especially during the holiday season. So many special touches, and they go above and beyond to make your trip magical. 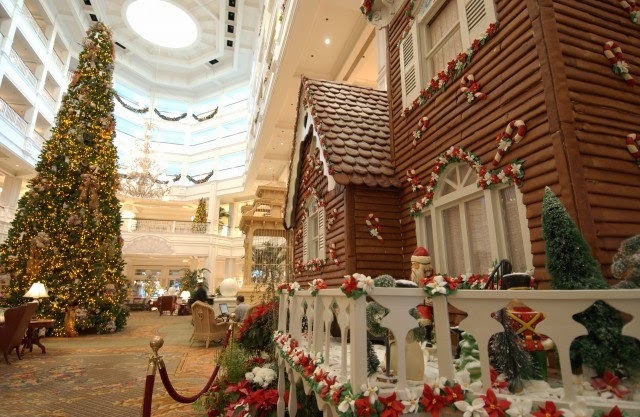 Now, speaking of decorations, how about a life size gingerbread house? Oh yeah, they have those too! 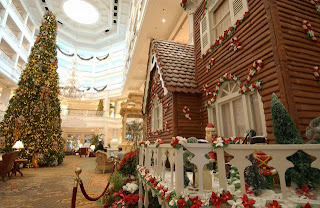 If you go around to the different resort hotels, they are decked out in Christmas cheer. From the gingerbread houses, to life size chocolate carousels, to carved statues, the magic never ends: you will just want to break off a piece to eat! Over at Epcot, they have the Candlelight Procession most nights. This beautiful show is incredibly popular, and features different celebrity guest narrators on different nights. They tell the story of Christmas complete with music, and this experience is incredibly touching. Moving over to Hollywood Studios, what we have next is something that will take your breath away. 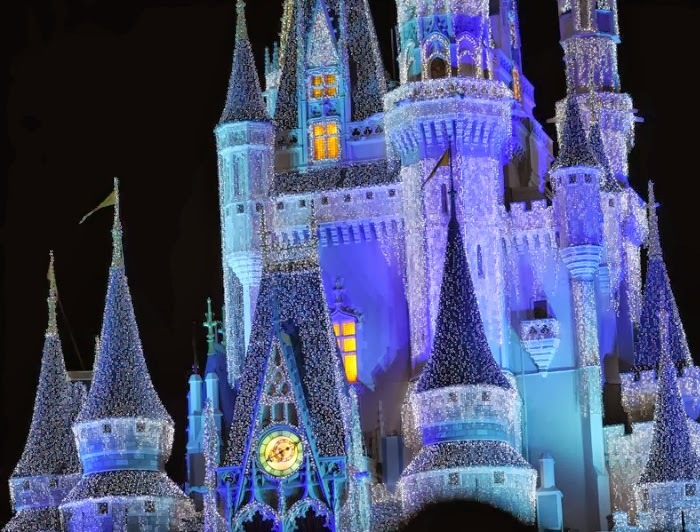 How about watching millions of dancing lights set to Christmas music? 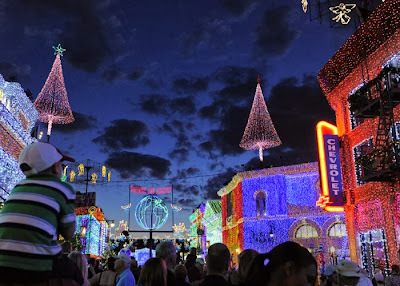 With the Osborne Family Spectacle of Dancing Lights, that is exactly what you will get. During the Christmas season, Disney’s Hollywood Studios streets will light up with color and music. This event is included with park admission, so that you can enjoy it whenever you like. There is a lot to be seen, trust me! In true Disney fashion, there are hidden items even in the lights. (like the purple cat they hide every year as a joke to one of the Imagineers.) So walk carefully, and see if you can spot it! Heading over to Animal Kingdom, this wild place is full of incredible animals, bugs that sing, dinosaurs, and a special parade filled with Christmas cheer. In the afternoons, you can see Mickey’s Jingle Jungle Parade, which travels all over the park. This awesome parade has all of your favorite characters, some jammin’ music, and unique floats. Mickey and friends sing and dance, and you might just get pulled into the action! I love all of the seasons at the Walt Disney World Resort, but there is something about Christmas that just touches my heart. The air feels different, it just seems to be electric with magic and wishes. Sitting along Main Street, sipping hot chocolate, gazing at Cinderella Castle, or listening to the Christmas story being told….it is just such an incredible place. The magic is waiting. 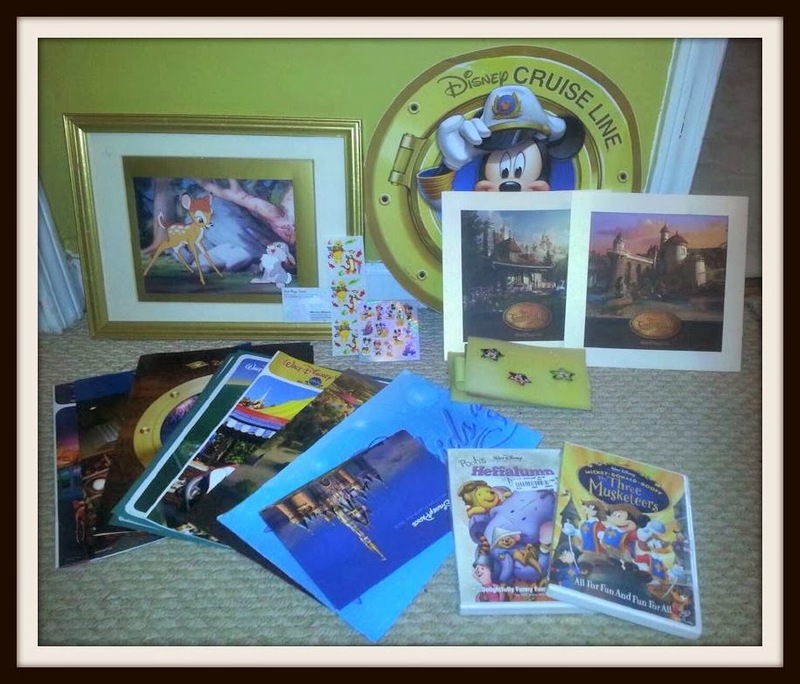 Sherry Jackson is a wife, mother, blogger, and Disney Travel Agent. She loves all things Disney, and loves sharing them with the world at Disney By Pixie, and Enchanted Ears Travel. This week we have a lovely Disney goody set from Disney by Pixie. Set includes 3 collector pins (Mickey, Minnie, and Goofy), Limited edition framed Bambie lithograph, 2 Fantasyland lithographs, Disney World DVD and book, Cars coloring book map, growth chart, Stickers, window cling, Pooh's Heffalump Movie DVD, and The Three Musketeers DVD. That's over a $150 value! Contest ends next Thursday! My favorite part are all of the ornaments. I have always wanted to see them all. I love all things Disney! the decorations are great. 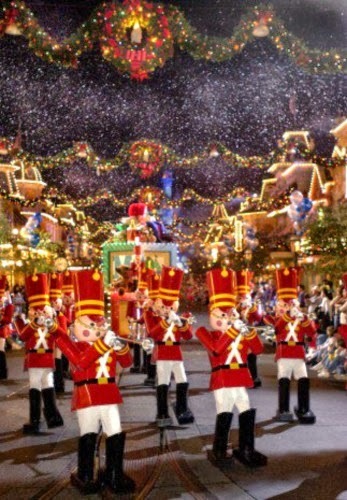 Weve never been but Id love to see the holiday parade and all the charectors dressed up. Hello everyone and thank you so much for the great comments! I have loved all of them! Dawn, would you like a quote for a trip? I would love to help you book and plan! Let me know! Happy Halloween!